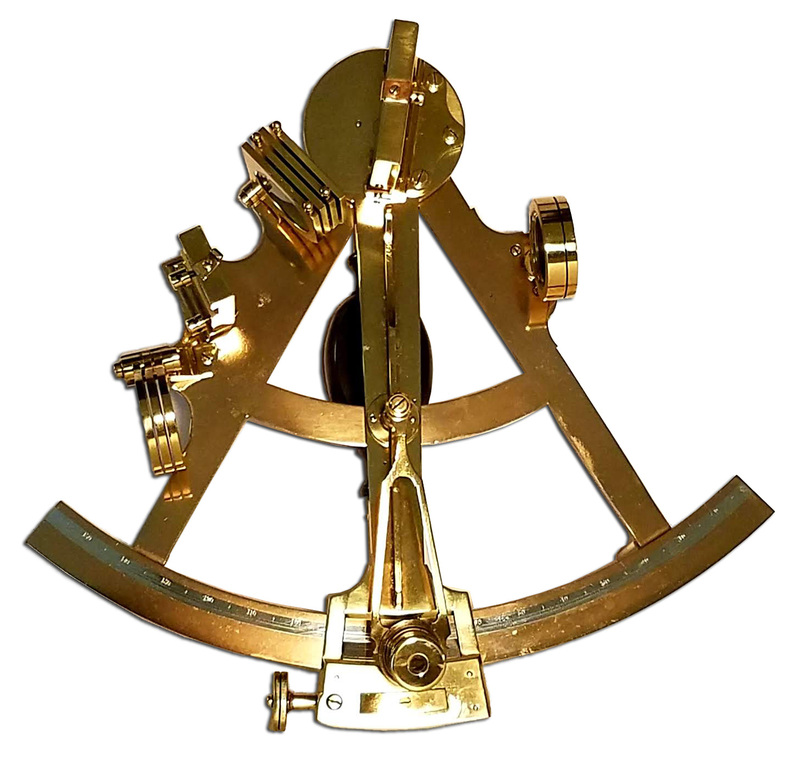 To view our current inventory of high quality pre-owned premium brand sextants, click here! Shown below are examples of rare navigation instruments of the highest quality which will appeal to the most discriminating collector. We specialize in only the finest antique and early examples whose history and features are carefully explained. 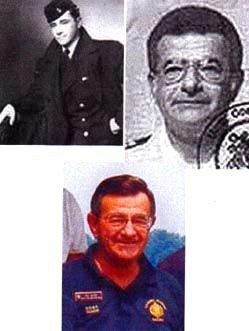 Our background in the Navy and Merchant Marine which spans over 30 years in which we actually navigated by using Celestial Navigation makes us uniquely qualified in finding, testing and offering these instruments for sale. At the top of the list are instruments from the English and European makers such as Hadley, Rasmussen, all the Spencers, Troughton, Filby, and C. Plath combined with American makers such as Stackpole, Thaxter, Negus, Bliss, Lincoln, Blunt, and many others. SATISFACTION GUARANTEED: All our sextants come with a money back guarantee, and can be returned within five days of receipt if not completely satisfied. The only conditions are that an email authorization be obtained, and that it be returned in its original condition and packaging, and be insured for its full value. Shipping charges are included in this offer within the continental United States if we were in error. To view our current inventory of pre-owned contemporary premium brand sextants, click here! FAMOUS MAKER J W NORIE & WILSON EARLY ENGLISH SEXTANT/QUINTANT CA 1850 Very rare sextant, and one which will appeal to those familiar with the history of navigation. It was made by John William Norie.FOR SALE! 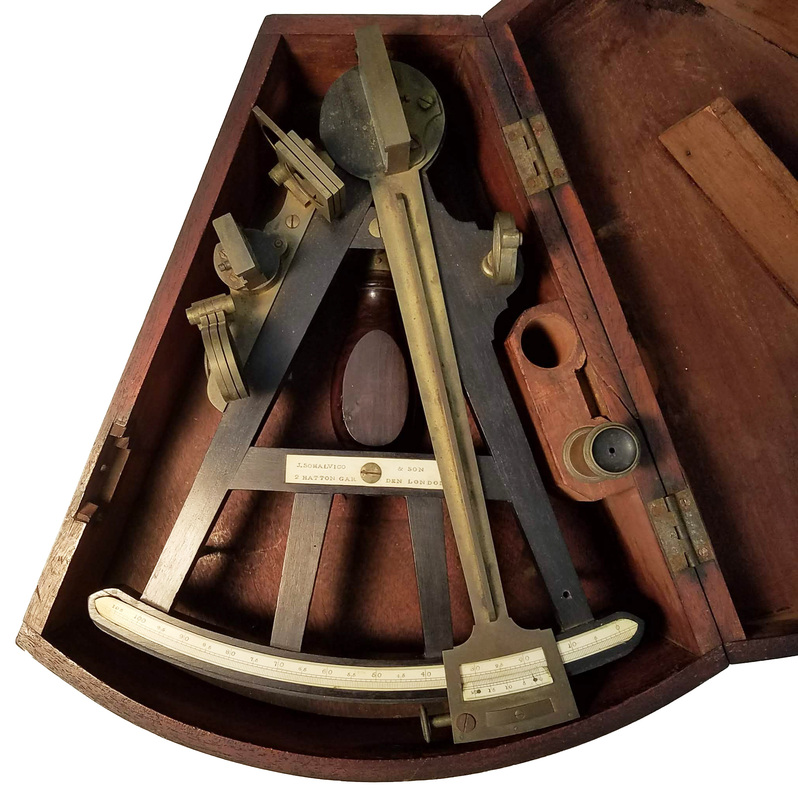 Early Ebony & Ivory Sextant/Octant BY J. SOMALVIGO & SON, 9 HATTON GARDEN, LONDON Very rare early 19th century mariner's sextant with ebony frame, ivory graduated arc and vernier, and bronze fittings.FOR SALE! Spencer Browing & Rust Sextant Ca 1840 C.R. Sherman,New Bedford Label Exceptional Presenation Quality SOLD. Thank you! 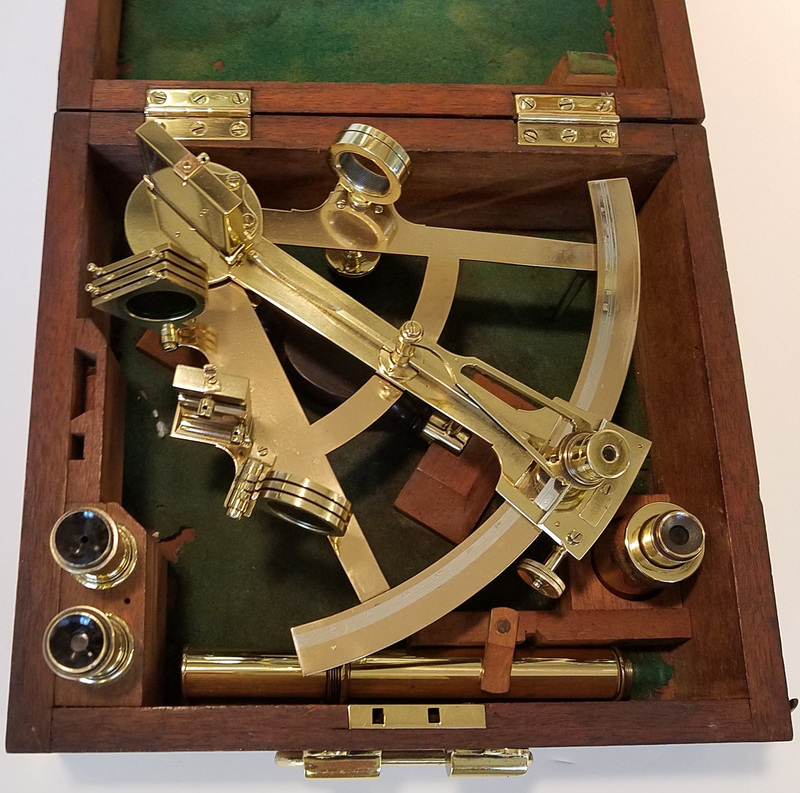 Antique Early Brass Sextant - Quintant Ca 1860 Owned by Hobart Olson Former Commodore Milwaukee Yacht Club Exceptional Quality original condition SOLD. Thank you! Rare Antique Polished Brass Presentation Quintant Magnificient Machinery, Unusual Frame Chadburn & Son Liverpool Exceptional Quality Ca 1880 SOLD. Thank you! Unique Front Focus Marine Telescope Single Draw 27 mm Objective Lens No Maker's Mark Ca 1790 18 inches closed 31 1/2 inches Open 1 lbs 14 oz Excellent condition SOLD. Thank you! Rare Antique Octant Made in Canada Ca 1860 Della Torre & Company Halifax & St. Johns Early Fan Shaped Case Original condition SOLD. Thank you. Corporate Gift! Important Presentation Qintant - Sextant Brandis & Son, Inc., Brooklyn, NY 1916 Excellent Condition! SOLD. Thank you! Earliest C. Plath Bronze Frame Sextant - Quintant 1898 Presentation Grade Quality Unusual Flaming Wood Case SOLD. Corporate Gift. Thank you! Rare C. Plath Premium Quintant 1928 Pre War Quality - Exceptional Condition SOLD. Corporate Gift! Antique Heath Hezzanith Qintant - Sextant Display Heath & Son, England Pre-1900 No Case Excellent Condition SOLD. Thank you! Diameter inner Circle 3 1/2“ Weight 8 1/4 oz SOLD to Australia. Thank you! Very rare and historic C. Plath - Three Ring ( Dreikreis) Quintant Ca 1900 near Mint Condition One of a very few made CLICK ON PICTURE FOR DETAILS SOLD to Germany, Corporate Gift. Thank you! Rare Negretti & Zambra London Single Draw Admiralty 40 mm Telescope Named to L.S. Andrews 19 inches closed 25 inches Open 1 lbs 8 oz Excellent condition SOLD. Thank you! SS WOODLARK 24 inches closed 31 inches Open 2 lbs 6 oz Good solid condition SOLD TO New Zealand. Thank you! Octant Anchor Mark Advanced Features 14 inch Hadley Style Keystone case Quality original condition CLICK ON PICTURE FOR DETAILS SOLD. Thank you! C. Plath's Earliest Bronze FrameQuintant - Sextant. Flaming Mahogany CaseFOR SALE! Rare Troughton & Simms Double Frame Polished Brass Presentation Sextant Named to Robert Way Desirable Fan shaped caseFOR SALE! Rare 16 inch Hadley Style Three Mirror Octant Rare Mahogany Frame Brass encased wood index arm Ca 1745 With Period CaseFOR SALE! Rare18 inch Presentation Three Mirror Octant Gold Gilt Machinery, Mahogany Frame Brass encased wood index arm Ca 1795 Exceptional Quality original condition SOLD. Thank You! Rare 14 inch Bradford Brothers Advanced Sextant Possible Award Recipient 1863 Advanced features. Original conditionNo Case due to sizeSOLD. Thank you! Rare Henry Hughes & Son Double Frame Quintant - Sextant.Strapped brass case with Campaign HardwareSOLD for corporate gift. Thank you! Rare Troughton Giant Double Frame Sextant One of the First Ca 1788 Exceptionally Rare Polished & LacqueredSOLD to Austria! British Admiralty Single Draw Marine Telescope 40 mm Objective Lens No Maker's Mark Ca 1875 20 3/4 inches closed 30 inches Open 3 lbs. Excellent condition SOLD. Thank you! Antique Museum Grade Quintant All Original including Finishby Chadburn & Son Liverpool for John Bliss & Co., New York Exceptional Quality Ca 1870SOLD. Corporate Gift. Thank you! Important Admiral Gago Coutinho Sextant Made by C. Plath 1936 Original aluminum case Pristine Condition SOLD to a descendant of the ADM. Thank you! Rare Sheffield Silver Plate Ca 1820 Three Draw 38 mm Telescope Finest Quality Unsigned 10 inches closed 29 3/4 inches Open 1 lbs 9 oz Excellent condition SOLD. Thank you! Rare 14 inch Hadley Style Three Mirror Octant Jesse Ramsden Anchor Mark Ca 1795 Keystone stair step case Exceptional Quality original condition SOLD. Thank you! Rare Double Frame Henry Hughes London, 1890 Quintant-Sextant Outstanding condition SOLD. Thank you! Very Rare Keuffel & Esser Co. 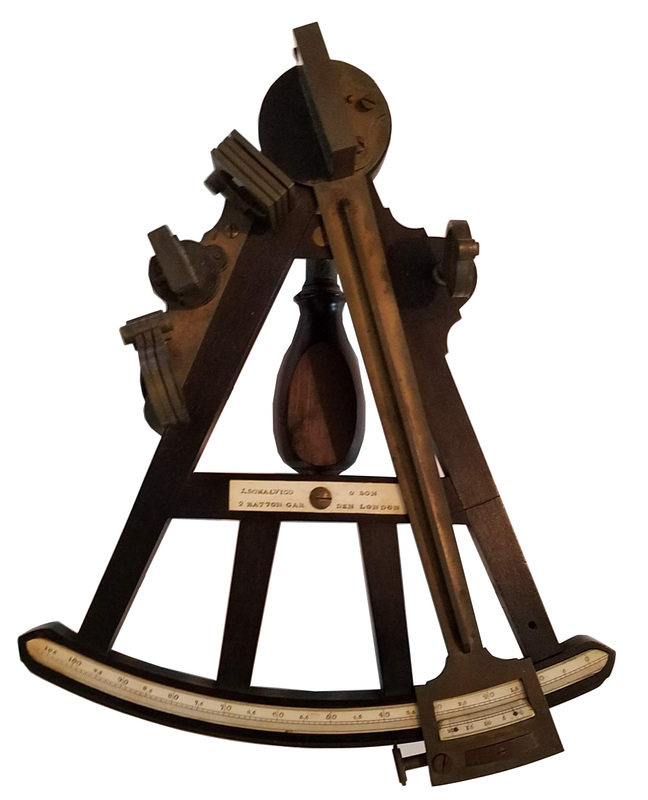 Important Hadley Style Large Octant By Spencer Browning & Rust London 16" Index Arm Ca 1750 Outstanding condition CLICK ON PICTURE FOR DETAILS SOLD. Thank you! Very rare Spencer Browning London Brass Quintant (sextant) Ca 1840 Negus label & Certificaton of 1934 Outstanding original "Mint" condition CLICK ON PICTURE FOR DETAILS SOLD. Corporate Gift. Thank you! in 1862 and began selling sextants. Rare Double FrameSpencer Browning London Ca 1841 Sextant Likely made by Troughton Outstanding condition Keystone case Two New England whaling labels SOLD, corporate gift. Thank you!